Unfortunately we are currently out of stock of this item. We suggest you buy 6V-250MA-SOLAR-PANEL here instead. These 6 Volt 250mA monocrystalline solar panels are perfect for making small solar battery chargers for charging NiMH or NiCd AA, and AAA batteries as well as devices such as iPods. In good sunshine the 250mA current generated is enough to charge four high capacity rechargeable AAA batteries or an iPod in just four hours. If you are interested in making your own Solar Battery Charger then you will find all of the parts you need in the REUK Shop including battery holders, blocking diodes, current limiting components and much more. The panels are very robust being constructed from resin and fiberglass and they are waterproof making them perfect for outdoor use. 100mm leads are already fitted to the panel. 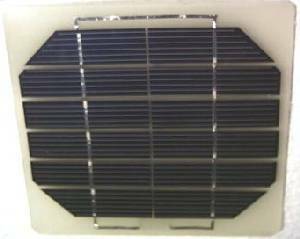 These panels can also be used directly to power 6V water pumps in garden water features, small motors in models, or to enhance solar garden lighting.